5-in-1 chestpiece design provides unparalleled versatility. 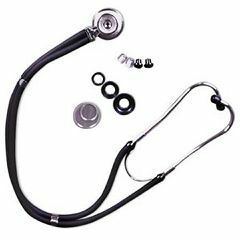 Threaded chestpiece drum permits the use of 5 interchangeable chestpiece fittings, an adult and pediatric diaphragm and three bells for accurate detection of high, middle and low frequency sounds in children and adults. 30" overall length.